From the identity of the lizard on your backyard fence post to the distribution of venomous snakes in the state, “The Reptiles and Amphibians of Arkansas” offers a comprehensive guide to a fascinating group of creatures and their habitats. 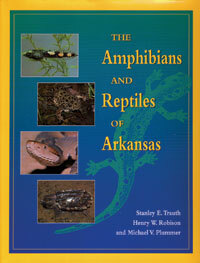 Stanley Trauth, zoology professor at Arkansas State University; Michael Plummer, biology professor at Harding University; and Henry W. Robison, biology professor at Southern Arkansas University, worked for 15 years to create this book featuring 136 species and subspecies with more than 500 photographs and line drawings and more than 100 maps. The list of animals includes salamanders, frogs, toads, turtles, lizards, snakes – and even alligators. The book begins with a chapter on the ecoregions of Arkansas, setting the stage for a discussion of the distribution of reptiles and amphibians within the state. This is followed by chapters on observing the animals, conservation and exotic species. The individual entries for a species usually feature a photograph of the animal, its distribution, habits, habitats and conservation status and remarks. Most entries also have a map that shows the distribution of the species in Arkansas, and occasionally its distribution in the United States. The book will appeal to both biologists interested in field research and armchair naturalists who want to learn more about these unique creatures.